New Book: Transformations Of The Sun — Dr. BethAnne K.W. I have this belief about our lives being the ultimate form of creativity. We are the art; forever creating and coloring and changing the being of our canvas as we learn and grow. And the choices we make in our lives are the external expressions of that art. What we create and produce and share and try to bring to light is a reflection of our inner being. 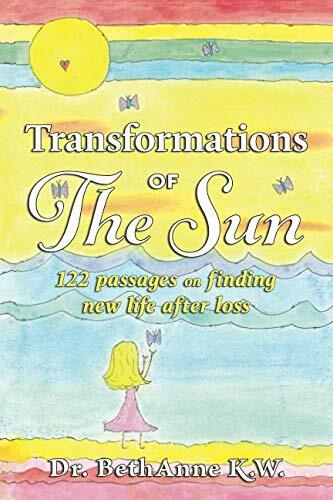 I have a new book out today, Transformations of the Sun: 122 passages on finding new life after loss, and as I was doing the final proofing of it over the weekend it struck me how artistic of a book it is. A 122 passage long collage of poems, essays, prose, and reflections, which create a bigger image of my journey from Alaska to Kauai and my personal journey of change since losing my brother in 2016- Transformations is my version of a multi-media canvas. It’s real and vulnerable. It’s human. It’s filled with struggles and grace and the truth about what it was like to walk away from a well-grooved, well-practiced life at 40 years of age and move to an island for reinvention. It scared me to write parts of it and own my experiences to such a degree, which is how I know I’m writing from a real space. And how I know I needed to write the words. But I’m not scared anymore. The act of putting words to and owning my experience, allowed me to claim myself in a greater way, release my fears, and create new space on my canvas. As Transformations is a sequel to my grief book, Lamentations of The Sea, I will share that I believe there is a third book coming, and I’ve been writing a trilogy all along without fully knowing it. But that’s a future work, which hasn’t been created yet, because I’m currently discovering and living my own art. In the meantime, Transformations is out and you can find a copy here if you feel inspired! May we all keep finding whatever change we need to be our truest versions of self in this life and keep creating authentic expressions of being. p.s. The empath, intuitive, and psychologist in me feels the inclusive need to add that I write and live life from the inside out. It’s my process, I’ve learned to embrace it, it works for me. But some people live life from the outside in- they need to create the external structure to help figure out their insides, and that kind of architecture is also artistry. All ways are valid- it’s just one giant circle of choices filled with infinite ways of being, creating, and processing life. And what a beautiful thing that is.